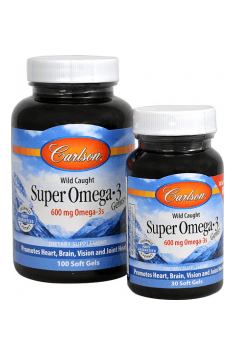 Carlson Labs Super Omega-3 Gems is a dietary supplement that provides omega-3 fatty acids derived from high-quality concentrated oil of fish that live in the cold, deep and uncontaminated waters in Norway. The preparation was created to ensure the health and proper functioning of the cardiovascular system, nervous system, and eyesight. Omega-3 fatty acids belong to the group of essential unsaturated fatty acids (EFA). They have a double bond in the 3rd position, counting from the farthest atom from the carboxyl group. There are 11 essential unsaturated fatty acids, of which the most important are eicosapentaenoic acid (EPA), docosahexaenoic acid (DHA) and alpha-linolenic acid (ALA). The latter before being used by a human body must be transformed into the two previous ones, which only proves their great significance for the body. Interestingly, the ratio of DHA to EPA in fish oil depends not only on the fish species but also on their physiological status, the place of fishing or the season of the year. Docosahexaenoic acid (DHA) is very common in the plasma membranes of the entire body. It is particularly important for the brain, in which it accounts for up to 50% of the membrane phospholipid fraction. DHA stimulates the growth of nerve cells, making them more multi-polar, branched and have longer protrusions. It is also the basic component in retina cells, which are responsible for both color and night vision. Docosahexaenoic acid is also a substrate for the compounds with anti-inflammatory and protective influence on tissues exposed to damage. Importantly, the body of an elderly has a lower activity of the enzyme affecting the synthesis of DHA, hence the omega-3 supplementation in the elderly is also very important. Recent studies show that this may slow down the development of symptoms of dementia and Alzheimer's disease. Eicosapentaenoic acid (EPA) has a very strong effect on the cardiovascular system, helping to maintain a good condition of the heart and normal blood pressure. It affects the lipid profile, lowering triglyceride levels. Due to the fact that it reduces blood clotting, EPA may help in the fight against thrombosis. EPA is also used in therapies against mood disorders, depression as well as aggression and ADHD, because similarly to DHA, it is of great importance for the central nervous system building cells and the transmission of information between nerve cells. It also has a strong anti-inflammatory effect. In children and adolescents, providing the right amount of long-chain fatty acids is very important because of their effect on the development of the central nervous system, as well as on the overall growth of the whole organism. Omega-3 are added to infant foods as to make them more similar to breast milk – since the enzyme system of infants is inefficient, the fatty acids supplied with the female food are essential. Children who are nourished with omega-3-enriched foods are distinguished by better cognitive abilities, have greater visual acuity and are less likely to experience atopic skin changes and allergic reactions. Supplementation with omega-3 acids in pregnant women may reduce the risk of early delivery and increase the body weight of a newborn; it also affects its proper development. What's more, since pregnant women must be very careful about what fish they consume (they are more exposed to poisoning with heavy metals), it is advisable to administer a tested and safe preparation. Omega-3 fatty acids improve heart function, which is why they can be one of the elements of prevention of cardiovascular disorders. They are credited with the ability to inhibit the ventricular fibrillation caused by ischemia. In addition, they can prevent blood clots (they have a thinning effect on blood and prevent blood cells from sticking to damaged vessel walls). Omega-3 fatty acids also affect cholesterol levels. They may increase the level of HDL (the so-called "good cholesterol") and lower the level of LDL ("bad cholesterol") and triglycerides, thus slowing down the rate of atherosclerosis. Omega-3 may also lower blood pressure in people with hypertension. EPA and DHA fatty acids help to reduce the synthesis of cytokines that initiate inflammatory reactions (which can stimulate the growth of tumors), proinflammatory prostaglandins (hormones responsible for such symptoms as swelling, redness and pain) and inhibit the synthesis of endothelin-1 (the ET-1, an amino acid present in pathogenesis of many kidney diseases). According to studies, supplementation of appropriate doses of EPA and DHA may also reduce the number of inflammatory precursors in rheumatoid arthritis. They do not replace the therapy, but they can have a significant impact on its results. These acids also suppress the excessive immune response in bacterial and viral diseases. Omega-3 fatty acids can relieve joint pain and stiffness that accompany rheumatic diseases. Since they facilitate the absorption of calcium, the acids are used both in the prophylaxis and treatment of osteoporosis. According to numerous studies, women who consumed large amounts of omega-3 (whether in the form of fish or supplements) had a reduced risk of uterine and breast cancer, men had reduced risk of prostate cancer and both sexes had reduced risk of pancreatic cancer. Omega-3s play a big role in the transmission of information between brain cells, which is why they are used as support in the treatment of ADHD and other developmental disorders. They can also be used in the treatment of depression associated with bipolar disorders. A special role is attributed to EPA. What's more, many products of omega-3 fatty acid synthesis affect the regulation of inflammation associated with depression (including prostaglandin E3). There are indications that DHA and EPA have a positive effect on body shaping. They reduce the expression of lipogenic genes that make the body store fat tissue. They also increase the activity of carnitine acyltransferase, which is responsible for the transport of fatty acids to the mitochondria, where they are transformed into energy. According to research, omega-3 acids also reduce the amount of cortisol – a stress hormone, the excess of which facilitates the deposition of adipose tissue and hinders the building of muscle mass (through the increase of catabolism). Not without significance is also the impact on the aforementioned pro-inflammatory cytokines, which degrade the protein in the body. Limiting their activity, therefore, has an anabolic effect on the muscles. In summary, Carlson Labs Super Omega-3 Gems is a dietary supplement with great health-promoting significance. Administration of the preparation will help to keep the cardiovascular system in good condition, reduce inflammation and protect against cancer. It is also recommended for pregnant and breastfeeding women and the elderly. It can also be used as an aid in the fight against depression. In addition, it positively affects the composition of the body, helping to obtain the desired increases in muscle mass and reduction of body fat. Adults: take two soft gels twice daily at mealtime. Due to distinctly better absorption, the supplement is recommended to be taken with a meal. It will also help to prevent unpleasant feelings that may occur if the preparation is consumed separately. Dosage is very often dependent on the purpose of supplementation. For proper functioning and prophylactic prevention, depending on the source, 250 mg to 1 g of omega-3 acids are recommended per day. In case of medicinal use, the doses are much higher and determined individually by the doctor (from 3 to even 8g per day). Carlson Labs is a company manufacturing dietary supplements, founded in 1965 in Chicago. It specialises in producing high-quality mineral and vitamin preparations and fish oils. The range of fish oils offered by the company is derived from wild species of fish, caught in Norway with respect to the environment. Products by Carlson Labs have won a number of awards, including a Best of Supplements Award for 2016, given by the magazine Better Nutrition. Soft Gel Shell (Beef Gelatin, Glycerin, Water), Mixed Tocopherols. Contains Fish (Anchovy, Sardine, and Mackerel).